South Gray girls named team of the week. In the winter, the Montezuma-South Gray girls’ basketball team, paced by Hannah Askew, Christy Wiebe, Emma Jantz and Debbie Peters, enjoyed a big turnaround, won 21 games and advanced to the Class 1A state tournament. In track, the Rebels were sixth in 1A with 34 points in 2018. Thus far, South Gray has delivered several solid showings with many of the key basketball players and could yield another jump this spring. At the 11-team Stanton County meet on April 2, the Rebels won with 123 points, 19 more than Syracuse. South Gray boys, which took significant graduation losses after back-to-back 1A state track titles, was fourth with 81 points. Stanton County captured the boys’ side with 128.83 points. Last spring, the South Gray girls’ 1,600-meter relay team took sixth at the 1A state meet and had three non-seniors with Emma Jantz, Megan Tarn and Christy Wiebe. Last year, Jantz and Wiebe were sophomores, and Tarn a freshman as the Rebels ran 4:18.72. As well, the 3,200 relay earned second with all non-seniors: Wiebe, Jantz, Tarn and Elizabeth Thiessen, a freshman last year. They posted 10:25.44. At Stanton County, Wiebe, Thiessen, Tarn and Carly Croft captured the 1,600 relay title in 4:36.93. Tarn was third in the 400 meters in 1:07.90. Wiebe won the 800 in 2:42.30. At ’18 state, Askew was tenth in the shot put with a mark of 33-10.25. This year, Askew was second at the Stanton County meet with a throw of 34 feet. Sublette senior Mercedes Martinez was 11 inches better to win the competition. Peters, who did not qualify for the state meet last year, has shown a nice improvement and has thrown the discus 114-8, which is currently third-best in Class 1A, according to Kansas historian Carol Swenson’s statewide leaderboard list. At Stanton County, Peters dominated the discus with a mark of 110-7.75, while her teammate, senior Shade Torres, was second at 91-11.75. They were the only ones in the field to clear 83 feet. Torres won the javelin with a throw of 131-5, and senior Jaden Nagle took second with a mark of 93-10. Last year, Torres qualified in the state shot put but did not place. In the javelin, she was state runner-up to Centralia’s Madison Lueger, one of the top javelin throwers in state history and a Nebraska signee. At the SC meet, Croft and Wiebe finished 2-3 in the pole vault with marks of eight feet and 7-6, respectively. In basketball, South Gray improved from 13-8 to 21-5 and advanced to the state tournament for the first time since 2010. The Rebels, under coach Paul Clancy, enjoyed much improved per-possession statistics across the board and consistently was under the radar. In an extremely talented classification with more than 100 teams, South Gray was never ranked in a Class 1A top-10 poll all winter. In December, SG also won the Cimarron tournament. In 2017-18, South Gray averaged 60.4 possessions a game with .86 points scored per possession and .67 points allowed per possession. This year, the Rebels had 54.9 possessions per game with .99 points per possession and just .56 points allowed per possession. As well, SG lowered its turnover rate with miscues on 27.7 percent of possessions to 25, and upped its offensive rebounding rate from 32.7 percent to 35.6 percent. The Rebels’ improved defense came in part to one of the state’s best block and steal rates. The Rebels averaged blocks on 4.7 percent of possessions last year and had blocks on 8.2 percent of possessions this winter. South Gray had steals on 18.1 percent of possessions last year and 23.2 percent this season. The Rebels ranked in the top-10 among KSHSAA affiliated schools for blocks per game (4.6), and top-15 in steals per contest (12.9), according to MaxPreps’ statewide lists. South Gray enjoyed fine seasons from multiple players. Askew, the lone senior who saw consistent playing time, earned first team all-conference for the second straight year. She averaged 12.4 points and 8.6 rebounds. As a junior, she had 12.6 points and 8.3 rebounds. Overall, Askew averaged 9.1 points and 7.3 rebounds in her career. She tallied 824 points in 91 career games. Wiebe, after 11.1 points as a sophomore, finished with 12.4 points and four rebounds a game and collected second team all-league. 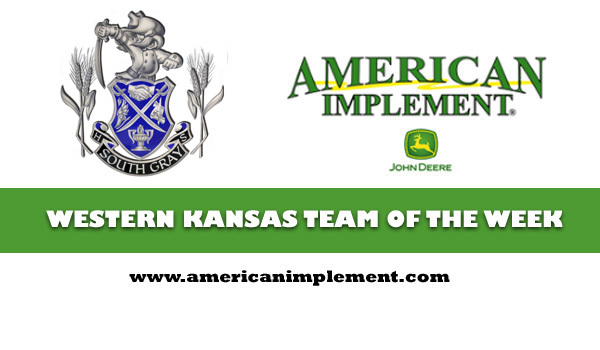 By the Kansas Basketball Coaches Association, Askew was a third team all-state selection, and Wiebe honorable mention. Wiebe tallied 17 points in 32 minutes in a 41-40 sub-state championship win against Spearville. South Gray had lost 58-49 in overtime to Spearville on Dec. 14. Jantz is one of the state’s best statistical distributors and was honorable mention all-league. She has six points, 3.7 assists and 3.2 steals a contest. Jantz finished ninth in Kansas in both assists per game and assist/turnover ratio (2.22/1). Peters had a key big improvement. Peters averaged 3.3 points, 2.6 rebounds and 0.4 blocks as a freshman. This winter, she delivered 7.1 points, 3.5 rebounds and 1.6 blocks a contest. Tarn had 7.6 points with 2.7 assists and 2.6 steals a game.